In this edition of adStream we have a tale to tell, involving an iHeartRadio ad-skipping loophole, and a native advertisement on a terrestrial webcast. As sometimes happens when entering a terrestrial stream, we caught it during a spot break. We noticed the Scan feature, which we hadn’t tested before. 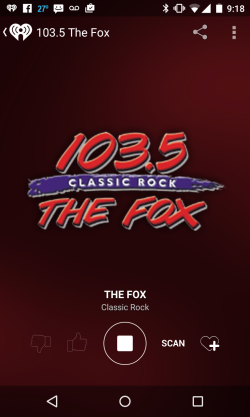 Tapping it, we were instantly taken to another Classic Rock terrestrial stream — The Fox 103.5 in Denver. First, we entered during another ad break. Heavy terrestrial spot loads really stand out when you skip from one stream to another and, by coincidence, hit two breaks in a row. Pureplays sometimes create a similar effect with pre-rolls — the listener is exposed to an ad before a new playlist or “station” begins. But a pre-roll is usually one ad, which is an easier hurdle for the listener and a better showcase for the advertiser. Second, the first ad we heard on The Fox was a native host-read commercial. The morning-drive DJ (and a sidekick) did a fabulous job with what sounded like sparse copy, mixing fact, testimonial, and a bit of personal experience. The performance was a beautiful demonstration that native ads — often associated with podcasting — also work well in personality-driven live radio. Third, the iHeart Scan function essentially provides terrestrial ad-skipping, and emulates a listener flipping the dial during spot breaks. The difference is that the “dial” in iHeartRadio has hundreds of stations on it, and the app keeps you within the music genre of the abandoned station. We didn’t “scan” our way out of the second spot break, because we were captivated by an interesting and entertaining DJ performance of native copy. So, there are two takeaways from this adStream journal entry. First, iHeart offers a remarkable feature with Scan, and a willingness to sacrifice its own commercial exposure in favor of a good user experience. Second, it’s all about content, even in the commercials. We know it in the Super Bowl, and we know it in podcasts. It can be true in radio advertising also.